As a Washingtonian transplanted in Texas, let’s just say this is my FAVORITE time of year (even though it will feel like summer for another month…it’s the promise of things to come when the season changes). There’s just something about a nip in the air and –yes, I’ll admit it–a Pumpkin Spiced Latte that make me feel like I’m getting a cozy hug from my heavenly Father 🙂 And the bonus? BOOTS! We have some excellent reviews for your cozy fall reading, A Waltz for Amber by Kimberly Rose Johnson and Pursuing Gold by Cynthia L. Simmons. A Waltz for Amber by Kimberly Rose Johnson was reviewed on Goodreads this past week. The book releases Oct. 2, 2017. Melissa Henderson rated it: Amazing! Each story I read from this author is wonderful and special. The characters are brought to life through vivid descriptions and details. How would you handle seeing someone from your past and that person had hurt you deeply long ago? Could you forget and forgive? The main characters each have their own difficult issues from the past. Read this heartwarming story and find out what happens with these sweet people. I received a copy of this story from the author and this is my honest personal opinion. Synopsis: With his father dead and his business partner incapacitated, Peter Chandler inherits the leadership of a bank in economic crisis. With only a newly-minted college degree and little experience, Peter joins his partner’s daughter, Mary Beth Roper, in a struggle to keep C&R Bank afloat while the Civil War rages around Chattanooga. Political pressure for unsecured loans of gold to the government stirs up trouble as tempers and prices rise. Their problems multiply when Mary Beth discovers counterfeit money with Peter’s forged signature. Can they find the forger before the bank fails? The two friends must pursue gold on behalf of their business, as they learn to pursue their heavenly Father to find hope and peace. 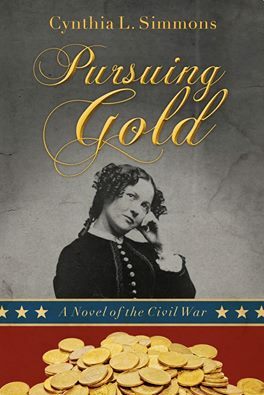 Critique: Exceptionally well written by an author with a genuine flair for deftly created memorable characters, Pursuing Gold is a riveting and original Civil War era story by Cynthia L Simmons. Very highly recommended, especially for community library General Fiction & Historical Fiction collections, it should be noted for personal reading lists that “Pursuing Gold” is also available in a Kindle format ($4.99).